PAROC Pro Segment WR 140 is a ready cut segment pack, also available in double layer, for medium and large size pipe elbows in high temperature made of non-combustible stone wool pipe section. 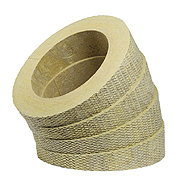 These factory made insulation parts give the best insulation solution for big pipe elbows without heat bridges. PAROC Pro Segment WR 140 can be used to satisfy the requirements as given in the tables for insulation thickness in BS5422:2009. Paroc can offer help and assistance to customers to confirm that the insulation systems proposed do in fact, achieve the necessary performance criteria. PAROC Pro Segment WR 140 conforms to BS3958-4.